Which airports are tops in customer service? Many modern-day airports mix transportation nodes with hospitality centers, focus on customer experience and offer fine dining outlets, luxury shopping outlets and full-service spas. Which airports do it best? Each year, Airports Council International — the trade association of the world’s airports — conducts extensive passenger surveys to find out. For its 2015 Airport Service Quality Award rankings, ACI surveyed more than 550,000 travelers worldwide about their traveling experiences. They ranked airports on everything from check-in and security to on-site amenities and food, beverage and retail options. “Airports have evolved into complex, customer-focused businesses in their own right that in many cases are in competition with each other for passenger traffic,” said Angela Gittens, director general at ACI World. “From duty-free and restaurants to ambiance, cleanliness, courtesy of staff, amenities, efficiency and more, air travelers are expecting big things from the airports through which they travel,” she added. 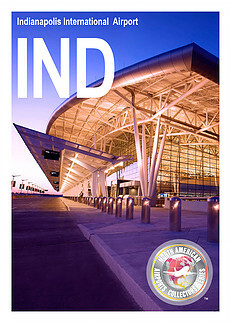 For the fourth year in a row, Indianapolis International landed in the first-place slot for airports in North America. The hub, which serves more than 7 million passengers a year, rolls out the red carpet for fliers who enter its gates. It has an extensive art program, many branches of local eateries, an apiary, a giant solar farm and a roaming robot that answers customer questions in real time. “When you combine a beautiful facility with a generous dose of Hoosier hospitality, great things happen,” said Angela Cain, director of public affairs at Indianapolis’ Airport Authority. Tied for second place among North American airports for 2015 were Grand Rapids’ Gerald R. Ford International Airport, Tampa, Dallas Love Field, Jacksonville and Ottawa. Third-place for North American airports also resulted in a tie, for Austin, Detroit, Sacramento, San Antonio, and Toronto’s Billy Bishop Airports. “These awards are particularly meaningful, because they are based on real-time feedback from our customers, while they are traveling,” said Thomas Naughton, CEO of Wayne County Airport Authority, which operates the Detroit Metropolitan Airport. See the full list of ACI Airport Quality Service Awards for 2015 here.